Corn has gathered a diverse reputation in the U.S. For some people, corn is a "staple" food that provides the foundation for tortillas, burritos, or polenta. For others, corn is a "snack" food that comes in the form of popcorn and corn chips. For still others, corn is a "special summertime food" that is essential at barbecues and cookouts. But regardless of its reputation, corn is seldom considered in the U.S. as a unique source of health benefits. Yet that's exactly what research results are telling us about this amazing grain. Different varieties of corn highlight different combinations of antioxidant phytonutrients. In the case of yellow corn, carotenoids lead the way and provide especially high concentrations of lutein and zeaxanthin. Blue corn is unique in its anthocyanin antioxidants. One particular hydroxybenzoic acid in purple corn - protocatechuic acid - has recently been linked to the strong antioxidant activity in this corn variety. Most studies of disease and risk reduction from dietary antioxidant intake have not looked specifically at corn and its impressive combination of antioxidants. However, in several small-scale studies, corn has been directly mentioned as a food that was important in overall antioxidant protection and a contributing factor in the decreased risk of cardiovascular problems. Some of the mechanisms for decreased cardio risk may be related to other properties of corn's phytonutrients that go beyond their antioxidant properties. For example, some of the phytonutrients in corn may be able to inhibit angiotensin-I converting enzyme (ACE) and help lower risk of high blood pressure in this way. We suspect that future studies will further confirm the important role of corn's phytonutrients in reduction of risk for a variety of health problems, and that antioxidant and other properties will play a key role in this risk reduction. One great piece of news about corn's antioxidants involves the practice of drying corn (still on the cob) or separated corn kernels. Research studies have shown that the drying of corn in temperature ranges as high as 150 -200F (65 -93C) does not significantly lower corn's antioxidant capacity. This research confirms the wisdom of many North American and Mesoamerican cultures which relied on naturally-dried corn in the preparation of meal foods, especially during the winter months. Interestingly, recent research has determined that the percent of amylose starch found in corn may be related to its antioxidant capacity. Higher amylose corn varieties have shown higher antioxidant capacity in some preliminary studies. While the jury is out on the exact meaning of these findings, this research reminds us to keep an open mind about the potential importance of antioxidant health benefits from corn. Thank you, Stephanie for the addictive blog award. Click here to visit Stephanie. Nothing like corn with lots of butter and sprinkled with salt. Copyrighted 2012, Christine's Pantry. All rights reserved. Place all ingredients in saucepan except butter. Heat through. 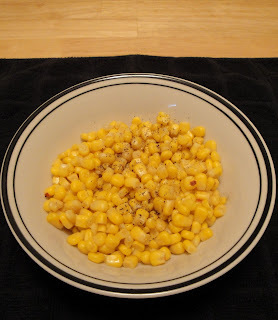 Transfer to serving bowl, drizzle melted butter over corn, sprinkle with salt and pepper, toss. Serve immediately. Enjoy! Wow, there is no end to corn history!